Our end is coming. It’s closer than you think. And it’s real. 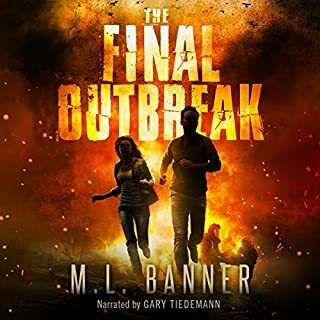 The final outbreak starts with the animals and moves swiftly to humans, turning the infected violent. Cities fall as the outbreak spreads as far as the winds blow, leading to society’s end. A lucky few may survive, but for how long in a world ravaged by an always present disease? Or is all hope lost? The planet has succumbed to a monstrous virus. Those who die from the infection return as savage zombies hell-bent on spreading the virus to the rest of the human population. The UK and Ireland are the last hold-outs, but when the infrastructure supporting their self-imposed quarantine collapses, it's everyone for themselves. Mike Fletcher and his sister Emma live in Leeds. With the city's streets overrun by the dead, their only option is to flee. They take their younger siblings and set off to find their last remaining relative in the far north-west of Scotland. Zabat's Comet promises a stunning astronomical display as it narrowly passes our planet. Then a solar flare nudges it hurtling toward Earth. Humanity crumbles during the countdown to doomsday. But Zabat is more than just a comet. The impact brings not swift extinction but a massive cloud of dust that appears to have a mind of its own. A sinister intelligence. A force that threatens to change what's left of humanity. Jack, Colleen, Lara, and Dan survived the violent chaos of the countdown. They survived the threat of extinction. 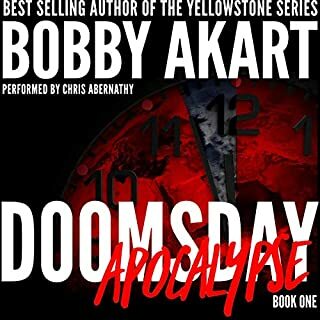 Now, they're about to find out that after doomsday, there are horrors even worse than death. This is a long and dusty slog through a apocalyptic event that is parts meteor strike, zombie and then alien invasion. There are a variety of overlapping characters that have some kind of connection, but don't interact (yet). There just seems to be too much going on with slow progress in the story. It seemed to take a long time to get to the point or a concrete plot, then leaves you hanging. It is part of a series, but I don't know that I have the patience to try the next installment. Generally the writing is good, but the story needs some paring. Andrew B. Wehrlen narrates a variety of characters and scenes with great style. Not about survival really, more about an alien invasion and how the characters react. I’m more into books where characters react and then survive a world ending event. good thinker. surprise. good book. I liked this book very much. It holds it's own within its genre. I do recommend this book. Now for the obligatory: "I was given this free review copy audiobook at my request and have voluntarily left this review." Part survival story, part alien invasion. I thought it was a new approach to the genre and I liked it quite a bit. The narration is very well done. I'll definitely look for the next books in the series when they come out. A very interesting take on the genre. 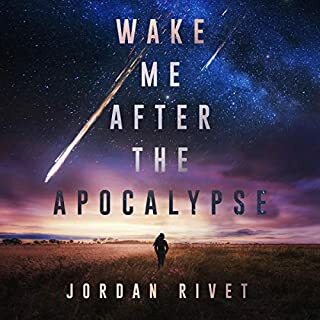 A very interesting take on the post-apocalypse genre. I enjoyed the story and the characters but it was the world building that really drew me in. The grungy background to the plot kept me asking questions and getting excited when my questions were answers. I wasn't a huge fan of the ending though. Andrew B. Wehrlen did a great job narrating. I really enjoyed his characterizations and pacing. Overall I enjoyed this story. I like the way the author takes a worldwide event and takes it down to a regional area and focuses the story in that area. Knapp does a very good job in working the characters and tying them together thru different tragedies. First things first: I was given this audiobook for free in exchange for my honest review. In terms of story, I thought this novel expertly portrayed a vivid and at time frightening depiction of end-of-the-world events. You begin the novel with several different characters, each with their own interesting backstories that really enrich the storyline. The author does a great job of representing the views and psychologies of a wide range of characters and intermingling their stories within the timeline. Also, kudos to the narrator, who did a great job of giving voice to each character in this novel and adding to the suspense and thrill of it. From beginning to end, he made this an enjoyable listen. However, I do feel like I have to put a trigger warning on this review. This novel does deal with themes of child abuse, domestic abuse, and drug abuse, and at times it gets eerily descriptive. There were a few moments where I had to put it down and walk away. If that kind of thing upsets you, then this book isn't for you. I received this book for free, in exchange for an unbiased review. A comet is heading for earth and with only 3 months warning, chaos ensues. This is a dual story of the apocalypse and not, told at once. Apocalypse, because everything at ground zero is about as bad as you can get, and not apocalypse, because as the rest of the world is not destroyed. While society continues to break down at ground zero and people are dying from hunger, other people and a mysterious disease, scientists are studying the events and trying to figure out what has happened and why the earth survived. This is a different concept, that is seldom explored. What would you do if you thought it would all be over tomorrow? And what if it didn't end? The story is definitely interesting, and I found myself always wondering what would happen next. Suspenseful, without being too much so. Dark at times, but with a hopefulness of better things. As outlined in chapter 1, one of the main characters' daughter was murdered. This turns out to be a major driving force for this character, and I couldn't be happier. I am frankly tired of protagonist fathers, who focus on their spouse and not their children. Usually, they cant wait to see their spouse, fight to get home to them, struggle to save them, give their lives for them...only to also have kids who either have few to no lines, and provide none of the motivation for the character. I was therefore encouraged to find that Jack's story was driven almost entirely by his daughters murder. The voice acting was good, although, there were some times when a line was delivered in opposition to the description to it. Like delivering a flat read line, followed by "he screamed". It wasn't often, but it is something the voice director should have caught. All in all, a fine book, with only a few problems (which are spoiler filled and I will outline below). Definitely worth checking out, and a fine opening to a series. My main complaints about this book are that in an area of millions, interconnected people are thrown together, and that the end poses more questions than answers. So, in the beginning, Jack hunts down his daughters killer who tells him about the real killer. We then have jack meet up with 2 other main characters. A therapist and a monster. 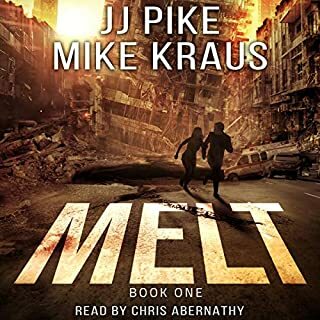 On the flip side, his ex wife and new family head to a FEMA shelter.Jack then spends the rest of the book in a slow journey to get to the FEMA camp is ex is at, while the therapist finds out the monster is Jacks daughters' killer. Jack gets to the FEMA shelter only to be in mind contact with his ex wife's daughter. With all the connections to Jack, I was surprised that the therapist didn't turn out to be Jacks ex wife's therapist. There is such a struggle to make everyone in the story interconnected that it just starts to become unrealistic. An area of around 7800 sq miles, and we cant get away from Jack`s connections. The other problem is that the story doesn`t end with the book. I assume when the publisher bought the book, they bought a series. Because book 1 ends with the story unfinished, to be presumably, carried on in book 2,3,etc. Personally I feel this is lazy. A book should end with the end of 1 story, then pick up book 2 at the beginning of story 2. They can be intertwined, a continuation, but there should be a clear ending. But that is my personal preference, I assume cliffhanger endings are popular because so many books and movies are ended with them. 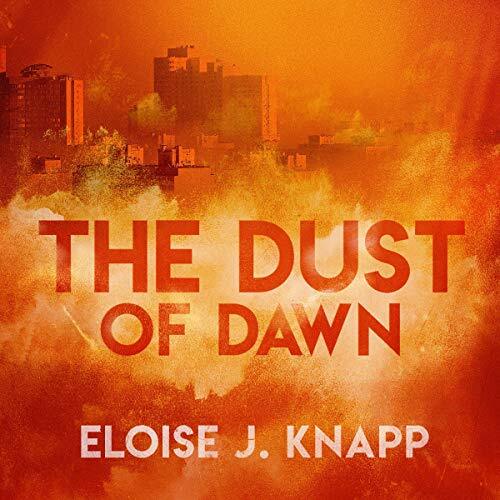 Occasionally it's good to pick up a title that isn't in your normal group of favoured Sci-Fi likes and here, with Dust of Dawn (Book 1) by Eloise Knapp, I'm glad I did. Eloise delivers so well enough of a 'confined' apocalyptic Sci-Fi mystery and keeps you chasing the bait, wondering what is on the end on the hook. So much so when the book came to a close, it was fair to say I was left a bit frustrated as I never had Book 2 lined up to continue on with the series. If there is any negative, and this is extremely minor, on occasion Andrew Wehren's narration can be a bit to fast, to the point were I did have to see if I'd accidentally knocked the speed of my Audible player up a notch or two. However, this isn't all the time and as said is a very minor negative in what is a highly enjoyable story. I'd truly recommend buying Dust of Dawn Book 1 as it's rather excellent. N.B. This title for free in exchange for an unbiased review. The world that the author has crafted is truly great. I love where we join the story in terms of societies break down and the impact of the comet on the immediate area and also wider world. The story runs with this premise really well. It's a grungy sort of world with absolutely amazing characters. It's well paced keeping you really engaged throughout. There's plenty of action and tension to the plot that keeps you wanting more. Jack is a great character and he is really well developed. I thought the author did a great job with their knowledge of science, giving things a realistic edge to the story. The narration was excellent. 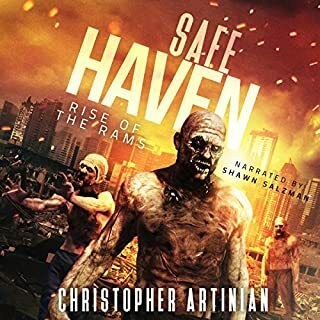 Andrew B. Wehrlen does a brilliant job in adding to the sense of pace and giving a feeling for this post-apocalyptic world as well as distinguishing well between the characters. Excellent all round. This was a really nice set up to what I'm hoping will be a great series. A nice sci-fi jaunt that was well worth a listen. There's a word from the author at the end asking saying she hopes there's an audience for here work - well, you gained a fan today. A cruel fate to wish upon anyone. When a 3 miles wide comet is knocked from it's pathway to head straight for Earth, it's people realize they have only three months to live. Society begins to rapidly break down and we follow five people living out the end of their days in different ways, counting down to the collision. But the expected world disintegrating explosion doesn't happen. Instead, a thick yellow dust coats the area of impact and, for many, a fate worse than death awaits them. Unfortunately, the brilliant opening premise of how to live on after three months of societal breakdown on both the personal and worldwide level is not then pursued. Instead, the reader continues to follow the survival attempts of the original protagonists in the area now filled with lethal dust and - something. It is still a fresh picture of the apocalypse but with many of the usual scenarios. The Dust of Dawn is the first of a new series, soon (I hope) to be followed by The Dust of Day. It is an easy, if sometimes graphically uncomfortable, read, the world building and initial discovery of the effects of the dust better than that of the character development. 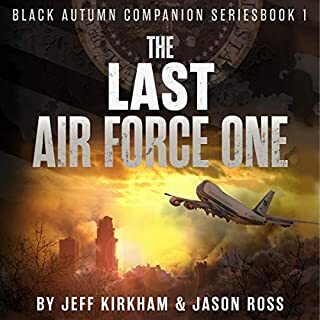 Narrator, Andrew Wehrlen, helps to overcome this deficiency with his excellent performance, breathing life into the characters as well as driving forward the story with his fine, fast paced delivery. My thanks to the rights holder who, at my request freely gifted me with a complimentary copy of the book, via Audiobook Boom. This is certainly a series that I am curious to continue.